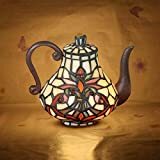 Found 9 Stained Glass Teapot Tiffany Lamps Tiffany Lamps Products. 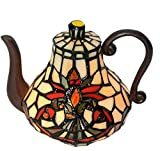 Size: length: 14cm, height: 40cmMaterial: stained glass shadeLamp cap: E14 screw capWeight: 3.5KGVoltage: 110V~240V (included)Application: coffee shop, bedroom, study, living roomNOTE:About color difference:Due to the difference in light, angle, and color difference of the display, the actual object may have a certain color difference with the picture. This is a normal situation. The actual color is subject to the actual object.About size:Because of manual measurement, there may be slight errors in the size of the product. 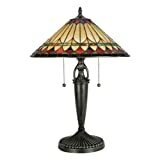 This is normal, please understand.About the smell:Before the delivery, the surface of the lampshade is coated with a layer of protective oil. When it is opened, the oil will smell slightly. After a day or two, the oil will not smell any more. Its main ingredient is white mineral oil, which is harmless to the human body. Please feel free to use it. 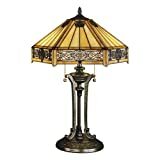 [Name]: Tiffany style table lamp[Material]: Shade: Stained Glass[table lamp size]: diameter 16 cm high 19 cm[lamp specifications] : E14*1(without bulb)[Voltage]: 110V-240V[Switching mode] : Online button switch[plug]: CE certified plug[lamp bracket]: bakelite[wire]: VDE double core black power cord[suitable for light source] :Incandescent bulb 15W[Applicable places]: hotels, bars, restaurants, entertainment venues, living rooms, bedrooms, etc. [Warm reminder]: When cleaning the lamp, you must turn off the power first. 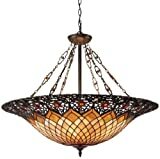 Do not wipe the lamp holder with a damp cloth to avoid leakage. 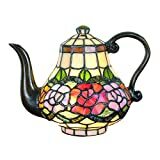 [Wall size]: 16CM wide 19CM high[lamp specifications]: E14 × 1[plug]: double flat plug[Switch]: On-line switch[Shade material]: TIFFANY stained glass is made by Tiffany traditional handmade soldering processApplication areas: restaurants, bedrooms, cafes, bars, hotels, hotels, etc.Remarks:1. 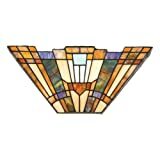 The brightness of the light is your own subjective feeling, depending on the wattage of the light source.2. Illuminate a warm home3C certification:We believe that the products you purchase are more important than the purchase of any products, because low-quality products are dangerous during use. 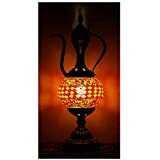 All of our lamps are 3C certified for peaceful use.If you have any questions, please contact us by email and we will resolve the issue as soon as possible. 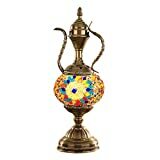 Item Weight：1.28kgProduct Dimensions：39*16cm（15 inch）Package dimensions：30*23.5*22.5CMName: Turkish Style Mosaic Bedside Table lampMaterial:stained glassLamp holder material: zinc alloy+ironVoltage:220VType of Bulb：LED（Does not include bulbs）Wattage：5WBe fit for:Dining room, Bedroom, Hallway,Living room, Study room and so on.Quality Assurance: Passing international safety and environmental protection standards CE certification, UL certification, PSE certification, ROSH certification▲Our lamps are packed in a box with specialised polyfoam that is cut out in the shape of the lamp to ensure it arrives to you safely and in impeccable condition. 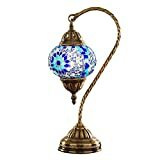 Item Weight：1.2kgProduct Dimensions：38*15cm（15 inch）Package dimensions：31.5*19*17CMName: Turkish Style Mosaic Bedside Table lampMaterial:stained glassLamp holder material: zinc alloy+ironVoltage:220VType of Bulb：LED（Does not include bulbs）Wattage：5WBe fit for:Dining room, Bedroom, Hallway,Living room, Study room and so on.Quality Assurance: Passing international safety and environmental protection standards CE certification, UL certification, PSE certification, ROSH certification▲Our lamps are packed in a box with specialised polyfoam that is cut out in the shape of the lamp to ensure it arrives to you safely and in impeccable condition. 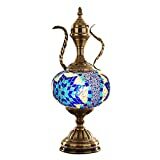 Item Weight：1.37kgProduct Dimensions：39*20cmPackage dimensions：52*16*15CMName: Turkish Style Mosaic Bedside Table lampMaterial:stained glassLamp holder material: zinc alloy+ironVoltage:220VType of Bulb：LED（Does not include bulbs）Wattage：5WBe fit for:Dining room, Bedroom, Hallway,Living room, Study room and so on.Quality Assurance: Passing international safety and environmental protection standards CE certification, UL certification, PSE certification, ROSH certification▲Our lamps are packed in a box with specialised polyfoam that is cut out in the shape of the lamp to ensure it arrives to you safely and in impeccable condition.